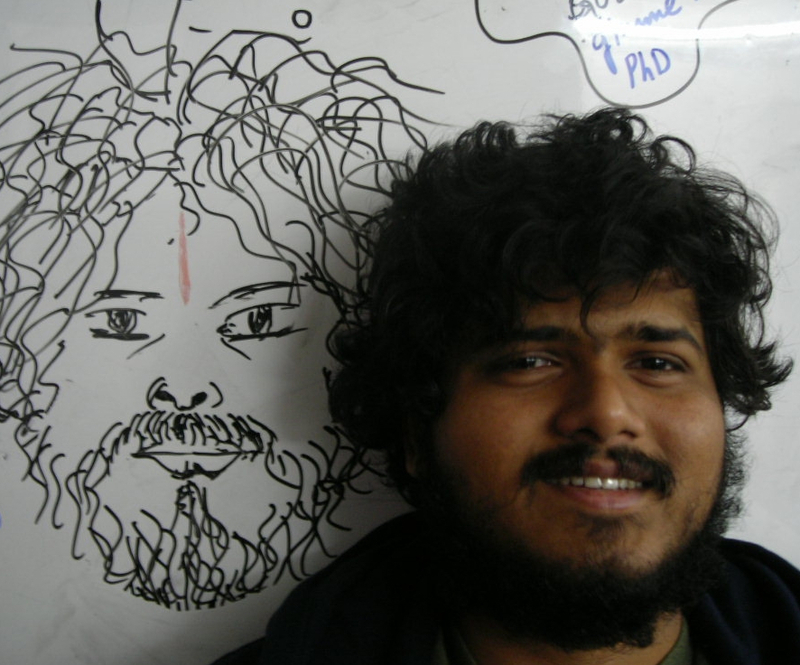 This week’s BEACON Researchers at Work blog post is by MSU graduate student Sudarshan Chari. Have you ever wondered about the relative contribution of nature vs. nurture? Or why certain individuals are more susceptible to a disease, or respond better to a drug treatment than others? Intuitively we know that individuals are genetically unique and react differently to their environment (like temperature, diet, etc.). The broad theme of my research focuses on understanding such conditional influences of genes (genotypes) on traits (phenotypes) in an evolutionary context using the humble fruit fly Drosophila melanogaster as a model system. 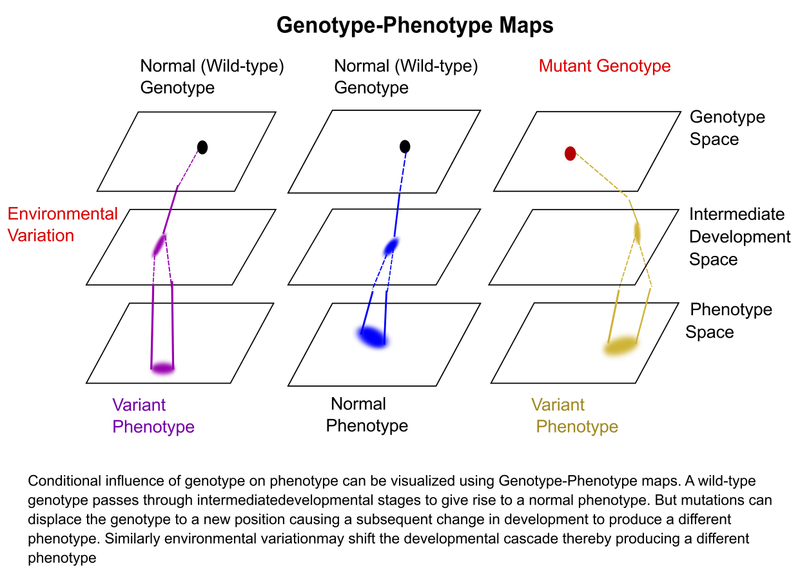 This idea of how genotype influences a phenotype can be visualized using genotype-phenotype maps (figure at left – click to enlarge). In this framework, one can combine all the gene/genomic components together and call it the genotype. If we plot all possible genotypes of an organism, we can represent it as a plane called the genotype space. Any point in this space represents the entire genetic makeup of an organism. We can also combine all possible phenotypes of an organism into an analogous phenotypic space, with the plane representing all possible combinations for the traits. For any individual you can draw a set of lines from its location in genotype space to its location in phenotype space. These lines will pass through many intermediate developmental spaces that describe how the genotype becomes the phenotype. The intermediate spaces include important processes like gene expression, biochemical pathways, cell and physiological aspects that shape the final form of an organism. 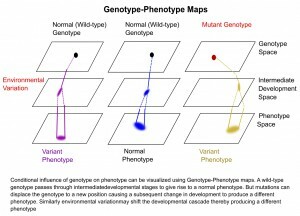 In this framework you can imagine if an individual gets a mutation, the genotype changes and gets displaced on the genotype space to a new point. Due to this displacement, the downstream cascade of development is also shifted, resulting in a different final phenotype. Similarly, if there is environmental variation like a drastic change in temperature during development, it can cause a shift in the intermediate spaces so that even if two individuals started from the same genotype may be distinct in phenotype space. One can now begin to visualize how variation in the underlying genes and environment influence variation in the final phenotype of an organism. This idea of context dependence is incredibly important for understanding complex traits. That a mutation, which causes diabetes or cancer in one person, may not cause harm in another, fundamentally changes how we think about disease and treatment options. Context is also important from an evolutionary perspective. Imagine that a mutation occurs in an organism, which by itself has no phenotypic effects – that is, a neutral mutation. But what happens if this mutation happens to occur in an organism that has other interacting mutations that facilitate the expression of a novel beneficial trait? If beneficial, selection would favor this combination by increasing the survival and reproductive success of any individual with them, thereby preserving this mutation. Thus, apparently silent or even harmful mutations can make certain evolutionary routes or adaptive paths possible when combined with other mutations, or expressed in a different environment. Consequentially, the evolutionary fate of a mutation can be conditional on the genetic background or the environment. In the Dworkin lab, we use ‘evolution in action’ to understand possible evolutionary fates of mutant populations via the process of compensatory evolution. We know that organisms are constantly bombarded with harmful mutations that can cause phenotypic defects and diminish fitness (how they survive and reproduce). For example, if a mutation causes wings to be smaller in a bird, then it may not be able to fly as well, or could be an easier target for a predator. In such a case, these mutated birds may not survive or reproduce as well as non-mutant members of the population. Although such deleterious mutations are usually eliminated by selection, they sometimes can get fixed (in other words, 100% of the population has the mutation) due to processes like genetic drift. Context dependence can help here too! Sometimes a new mutation will arise that conditionally interacts with the deleterious mutation and compensates for the fitness defects: two negatives can make a positive! We wanted to understand how compensatory mutations rescue populations with deleterious mutations. Do the necessary mutations already exist in natural populations? Or does evolution have to wait for a new mutation to occur? And in either case, how does the compensatory mutation solve the problem? By analogy, if a machine breaks down, you could either repair/replace the broken part to get it back to its original condition, or keep the broken part but change some other features in the machine to make it work again. In other words, you could fix the broken pipe, or just build a bypass around it. We fixed a mutation that disrupts normal wing development in a large natural population of fruit flies. This mutation makes tiny, shriveled wings which not only impairs flight, but also reduces fitness because males use their wings to sing to females during courtship. That is, wings are really important for mating and hence reproductive success. Large natural populations have a lot of genetic variation throughout the genome that might interact with the mutation we introduced to provide compensatory effects. We experimentally evolved populations of mutant flies, under two distinct selection regimes: one with natural selection, where the flies could choose their mates, and one with artificial selection where we carefully chose the most ‘normal’ flies for mating every generation. We see a rapid recovery of normal-looking wings in the artificial selection populations, indicating that there are naturally occurring alleles that can compensate for the loss of wings. However, the natural selection populations still look mutated i.e. no recovery. Does this mean natural selection is ineffectual here? Not at all, because these populations show increased mating behavior and also have better egg to adult survival, indicating an independent route to fitness recovery. 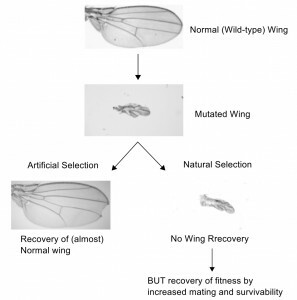 The two selection regimes thus compensated for the same mutation in very different ways: while artificial selection recovered normal development of the wings, natural selection took the alternative routes of increased mating and survivability. For more information about Sudarshan’s work, you can contact him at charisud at msu dot edu. Special thanks to Amanda Charbonneau, whose comments and suggestions were critical and instrumental in shaping this post.